We’re sometimes asked how the early modern recipe books we cook from ended up in library collections. It varies: some were purchased directly by the library, others were gifts. However they made it into holdings like the Kislak Center’s, we feel fortunate that they did. As I looked over the provenance notes for UPenn Ms. Codex 205, I saw a familiar name. The book was a gift from Esther Bradford Aresty, part of the Esther B. Aresty Collection of Rare Books on the Culinary Arts. Aresty (1908-2000) was a culinary historian and cookbook collector who donated her collection of 576 printed volumes and 13 manuscripts, ranging from the fifteenth to twentieth century, to the University of Pennsylvania. (For more on Aresty’s remarkable life and collecting, see here and here. Penn also holds Aresty’s papers, which I’m looking forward to digging into soon.) Aresty’s collection has already informed this project: of the recipe books we’ve cooked from so far, UPenn Ms. Codices 252, 625, 627, and 631 were also her gifts. In her first book, The Delectable Past: The Joys of the Table – from Rome to the Renaissance, from Queen Elizabeth I to Mrs. Beeton. The Menus, the Manners – and the most delectable Recipes of the past masterfully recreated for cooking and enjoying today (1964), Aresty transcribed and updated over 700 recipes from the volumes in her collection in order to make them widely accessible: “The more I wandered around in those precious volumes, the more I wanted to share them with others” (9). The chapters begin with “Antiquity to the Middle Ages – The Delicious Beginnings” and end with “Late 19th-Century America – Cooking Lessons Well Learned,” each detailing several recipes and images. 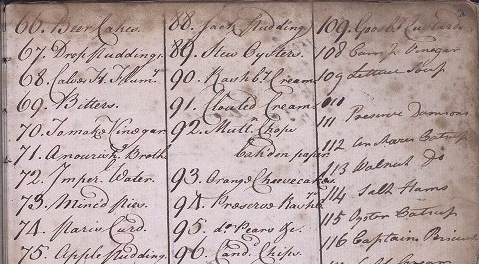 Aresty didn’t include any recipes from Ms. Codex 205, but it’s listed in the index as part of her collection at the time. She describes The Delectable Past as “the result of my adventuring through their pages.” Adventuring through the pages: what a perfect way to describe the experience of reading old cookbooks, or encountering older texts more generally. Aresty characterized her method as one of updating: “I’ve tried to adapt the recipes in the simple style that made them such a delight to read and follow. … With few exceptions, they are all easy to prepare, and rely on a subtle twist, or nuance, or combination, rather than laborious preparation. Though canned soups and other commercially prepared products have not been specified, they may be substituted wherever you deem proper.” And she encouraged experimentation: “You may arrive at some individual effects of your own while using the recipes in The Delectable Past. All have been tested in my kitchen, but your imagination can take over in many of them. After all, the same recipe will produce varying though equally good results in different hands. Yours may be better than mine” (12). As I read Aresty’s words, with Ms. Codex 205 sitting to one side, I felt like I’d found a kindred spirit. I’m looking forward to more adventuring in Aresty’s collection. UPenn Ms. Codex 205 begins with a handy table of contents of its recipes. I looked no further as soon as I saw #66: Beer Cakes. Beer Cakes? I had to try these. This recipe book was probably compiled from the last few decades of the eighteenth century into the first of the nineteenth. Recipe #130 is dated 1791; #162 is dated 1801. The last page of the book details the diet plan “Mr. Whilby of Wallington Norfolk” used to raise his calves in the winter of 1777. (Now, there’s a sentence I’ve never written before.) There is also a loose letter tucked into the volume, dated February 1808, from “AB” to Mrs. Edward Browne, copying the recipe for “A Sweet Jar” that’s also written into the book. The first 109 recipes (including the Beer Cakes) are written in one hand, then the rest of the book continues in at least six hands. I wasn’t the only one who found these Beer Cakes delicious, apparently: note the bookworm holes in the upper right-hand corner of the recipe page. old Beer, roll and bake them on Tin Sheets. 1/4 lb. butter (1 stick), room temp. Heat oven to 350F. Line two baking sheets with parchment. Combine all ingredients except the beer in a large bowl and mix with a spatula until relatively smooth. (You could easily do this in a stand mixer. I was feeling old school.) Add about half the beer and blend, gradually adding more as needed until you have a cohesive, stiff dough. It should be just wet enough to hold together but not so wet that it becomes soft and sticky. If it’s too wet, just add a bit more flour. Lightly flour your surface and rolling pin, then roll out the dough to about 1/4″ thickness. (The day I made these was pretty humid – see: Philadelphia summertime – so I found that refrigerating the dough for about 10 mins. before rolling it out made the process of transferring cookies onto the baking sheets much easier.) Cut them out in shapes of your choice. My handy 2″ circle yielded 46 cookies. Transfer to lined baking sheets and bake for 12 mins., or until dry to the touch and golden brown on the bottom. (Your kitchen will smell like beer. Not at all unpleasant.) Remove to a wire rack and let cool. 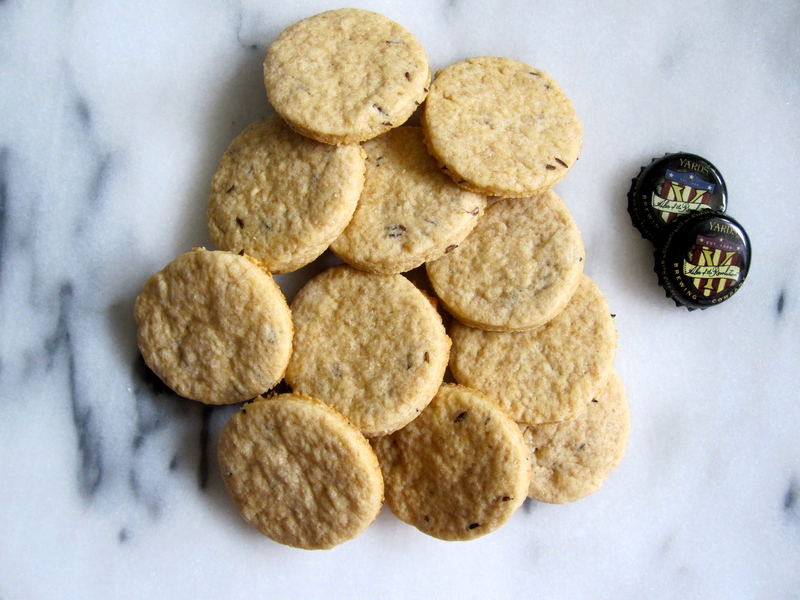 *A note about “a few Seeds”: Other “seeded” recipes we’ve made have called for caraway seeds. I also looked at several print and manuscript recipes for Seed Cakes, all of which use caraway. So, I feel fairly certain that caraway seeds are accurate for the Beer Cakes. However, you could certainly experiment – poppy? Sesame? **A note about the beer: I didn’t have any “old Beer” lurking at the back of my fridge – just as well, because I knew exactly which beer I wanted to use for this recipe. Philadelphia’s very own Yards Brewing Company produces three Ales of the Revolution, based on colonial brewing recipes. I was curious about how much the flavor of the beer would come out in the cookies, so I experimented by splitting the batch and making half with Thomas Jefferson’s Tavern Ale and half with Poor Richard’s Tavern Spruce. (I also made another batch with a lager, for additional experimentation. Same results.) I couldn’t really taste a difference, probably because the amount of beer in the recipe isn’t that large and the caraway seeds dominate; I definitely couldn’t taste the piney-ness that characterizes the Tavern Spruce. But I didn’t mind having the leftover beer with my cookies. Favorite recipe since Maccarony Cheese! Of the other “cakes” recipes we’ve tried, they’re most similar to the Desart Cakes, which I also liked very much. But the addition of butter and especially of beer give these a depth and richness that can be unusual for early modern cookie-cakes. (They’re still beige, of course. Marissa and I have started thinking of this project as the realm of beige baked goods.) 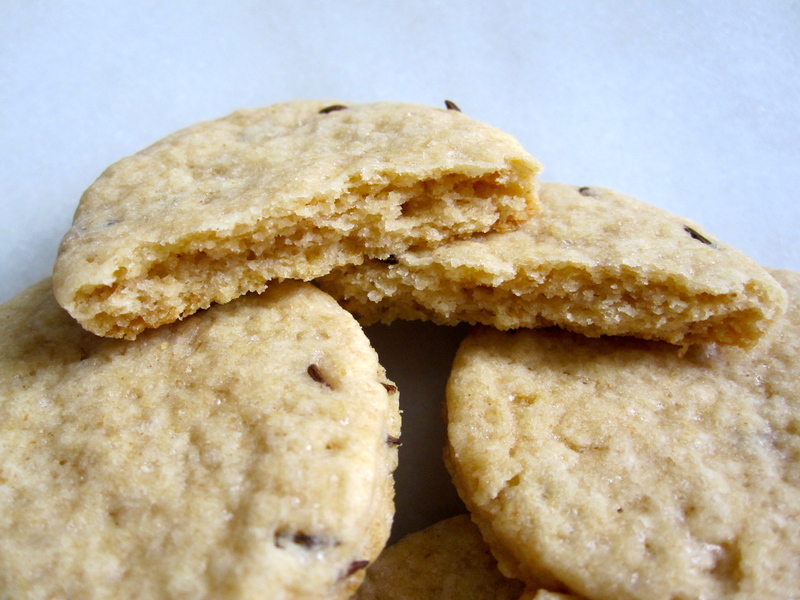 They don’t really taste like beer, but they have a richness and a nice crumb that’s less dense than the Desart Cakes. I’ll be making these again. Esther Aresty, I raise a beer cake to you and your adventuring. Thank you. I sincerely love this blog! Thanks very much! We love writing it. I’ve heard of beer bread, but never beer cakes like this! How intriguing. I was intrigued too! Which is usually how I decide on my next recipe: Ok, I’m intrigued, must make this and see how it turns out. Just wondering, since during this time neither baking powder nor baking soda nor bags of yeast existed, was beer used as a natural leaven the same way starters would have been used for bread during this time? After all beer does contain some yeast right? I was thinking along those same lines. Some of the recipes we’ve seen do call for “yeast,” so I’m looking into how yeast would have been available to early modern cooks. (And will report back.) But in this case, yes, the beer does seem to leaven the cookies at least somewhat; they were more tender than similar recipes we’ve made without the beer. Yeah. Cake doesn’t seem to be quite the same without baking powder, you don’t exactly the same kind of fluff from just adding lots and lots of eggs. Very interesting way of leavening though!! Not sure about the terminology 200+ years ago and on the other side of the Atlantic, but ‘Old Ale’ in England nowadays refers to a style of strong, dark, sweetish beers usually drunk in the winter. They’re also often used in recipes for things like Christmas puddings. So ‘old’ might refer to a style rather than ‘past its best’. What a fun blog. I found you by accident and loved reading through your recipes. I especially love that you show the books they came from. What a delight! You had me at Beer Cakes! I thought as I started to read that maybe these cakes would be akin to a soda bread, but they sound even more delicious than that. And what fun it would be to experiment with beer flavors (a fruity IPA perhaps?) I love reading this blog. And you thought beer was just for drinking? Read on! Thanks for great reading. The beer cakes sound tasty, and worth trying to see if the beer leavens them as well as flavors them. It may take me a while to get around to cooking them though because my time is going to an MFA at Antioch in Culver City. Just wondering — you are focused on 1600 – 1800 — are there also resources at Scripps for earlier years, particularly pre-1000 CE? My current focus is on the history of wheat, so many of your recipes are relevant. Your research sounds so interesting! We’ve been working mostly in the archive at the University of Pennsylvania because all of their manuscript holdings are digitized. (Follow the link on the “Beer Cakes” recipe to take a look at the library site.) I featured one of the two recipe manuscripts at Scripps College. There are not many additional resources at that library. The Huntington has a wonderful archive of culinary manuscripts that might help answer your questions. Let us know how your project develops. Beer cakes from the 1800’s. I’d like to try this recipe. Made a batch this morning in the kitchen on the Farm here at Yorktown Victory Center. So very delicious!